Experience a hypothetical God as if he exists, proposed Kelly in this series of four lessons: access to spiritual reality through the Holy Spirit in prayer, fellowship, God, and the spiritual world. Kelly focused on the sciences at Wilmington, but when he won a scholarship to Haverford College in 1913, he became interested in philosophy and began a lifelong friendship with Rufus Jones. From Haverford he went to teach at Pickering College in Ontario, where he kept up the antics that marked his youth, but tried to temper them for the more staid work of teaching. He worked as Young Friends Secretary for the Wilmington and Indiana Yearly Meetings during the summers. This opened his eyes to the need for committed local ministry among rural Friends. After two years in Ontario, he moved on to Hartford Theological Seminary. Here he developed a religious philosophy that centered on perfection. Kelly took a PhD. at Hartford, where he also met his future wife, Lael Macy. He ministered to soldiers in World War I in 1917, and later to German prisoners of war. Back in Hartford, he married Lael Macy and accepted a teaching position at Wilmington College. Earlham appointed him to a position in 1921, but he went to Berlin and helped create Germany Yearly Meeting within the fellowship that surrounded AFSC feeding programs in that country. Returning to the Midwest, Kelly missed the intellectual rigor of the Hartford Seminary and Haverford College and took a leave of absence from Earlham to study philosophy under Alfred North Whitehead at Harvard. There he did work on Emile Meyerson and showed signs of health problems similar to those of his father. After a year at the University of Hawaii in 1935, he took a post at Haverford and there introduced the first classes on Eastern religions at that school. In 1938, he went with Rufus Jones to Germany to raise concerns about the treatment of German Jews. When he came to Haverford, he also spent some time teaching at Pendle Hill and delivered the lectures printed in The Reality of the Spiritual World. These lectures outline the limits of reason and the philosophy that he studied through most of the nineteen twenties and thirties. He taught at Haverford and lectured at Pendle Hill while writing his fourth book. 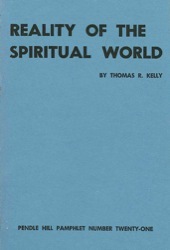 Just five days after delivering last of the lectures in this pamphlet, Kelly collapsed from a heart attack and died. It was 1941 and he was forty-seven years old.